Through a public letter addressed to Ecuadorians and foreigners, the Attorney of Exportadora Bananera Noboa S.A., Dr. Sylka Sanchez, published this thursday April 25 of 2013, in El Universo and El Comercio newspapers, with a copy to the embassies and chambers of commerce, Exportadora Bananera Noboa denounces that the seizure and eventual sale of property is a disguised confiscation which is prohibited by the Constitution. In this document, the company explains, that is of public knowledge the dispute that is being processed before authorities and judges, between Exportadora Bananaera Noboa and the Internal Revenue Service (SRI), with its officials and judges afraid of the retaliations of the political power since some magistrates have been removed and imprisoned for not submitting to the pretensions of the SRI, what shows that the justice depends on the Government. The letter also makes reference to the alleged tax debt as illegal and forged clandestinely, reason why they have not been allowed to take the argument to judicial authorities violating the guarantees of due process, but reiterates that they will continue to litigate in an absolute state of powerlessness, here in Ecuador, where is a previous condition before going to supranational courts in search of impartiality and justice. It clarifies that once the dispute is over they will pay the amount ordered by an impartial judge. The letter signed by Dr. Sanchez, insists that the Director of the SRI, Carlos Marx Carrasco, has not been able to explain why, in year fiscal year of 2005, the SRI, pretends to collect from Bananera Noboa the sum of $ 49,2 million, while Dole, that in the same year exported more fruit than Bananera Noboa, only paid $ 700.000 for tax income; Chiquita $ 39.500; Reybampac $ 14.219; and Del Monte $ 11.748. This is discriminatory and proves the political persecution, and is a bad reference to the investors. There is no legal certainty in this country, says the letter. And adds that “all the abuse within the tax area against businessman Alvaro Noboa are being witnessed by local and foreign investors; if this happens to the largest business group in the country, they could suffer the same fate”. 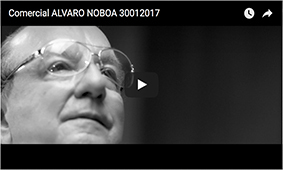 Indicates that there is a perverse political persecution going on which has damaged the image and the honor of businessman Alvaro Noboa, who is the number one taxpayer at a personal level, with this false debt, it has been carried out a campaign damaging the reputation of a moral citizen and businessman, of whom, the Director of the SRI, said left the country illegally when he left under a legitimate and constitutional judgement as the habeas corpus. Part of the persecution plot is the last statement from Economist Carlos Marx Carrasco, based in an information provided by an alleged Attache of the Investigation Office of the National Security Department of the United States Government, stating that Lawyer Noboa had left the country on March 15, which is false, as recognized publicly by the Minister of Interior, Jose Serrano, who admitted the mistake before the media. It concludes pointing out that ” we will continue to litigate nationally and internationally until we can prove this reality” and that they hope, as an Ecuadorian company, that President Correa will open to a dialogue, or failing this, to a civilized debate, for the truth to be revealed, according to the principles, values and rules that shape the law, which, in Ecuador, live, independent of the passage of a justice administration that has been guillotined within its independence and impartiality. amount determined by an impartial judge. judicial organs required to intervene. by the authors of the legal abuse. internationally, sooner rather than later. prices of oil, but the people working in the oil business are very few. of legal certainty causes that the investor loses over any claim. business group in the country, so they can undergo a worse fate. business group and private employer of the country. shamelessly, has a voice in this country! Noboa had left the country on March 15.
registered in his passport with entrances to another countries. internationally until we can prove the reality. will end and the nation will have an economic boom.